Wes Anderson returns from a four year hiatus to write and direct his second animated feature film. Could Isle of Dogs capture the acclaim of his previous animated offering , The Fantastic Mr Fox? 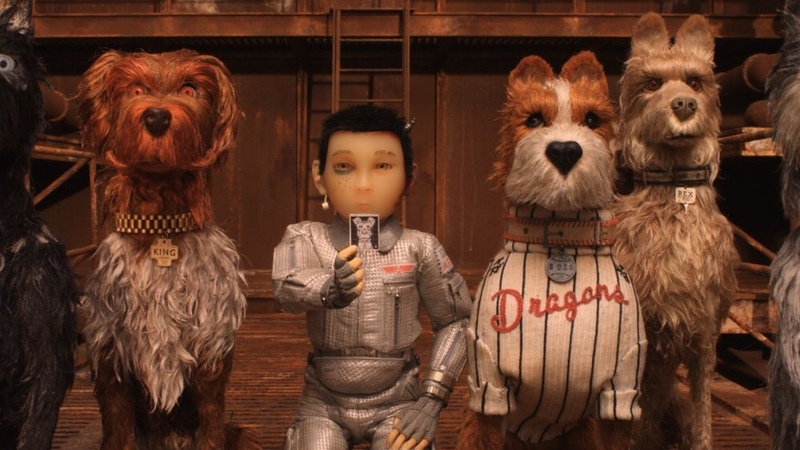 While I am guessing the “story by” credit given to Anderson, Jason Schwartzman, Kunichi Nomura, and Roman Coppola was born from an evening of very experimental drug use, Isle of Dogs has a fairly basic plot that could actually have been adapted into a traditionally animated Disney cartoon. The film is set 20 years in the future in a much more militant Japan, where dogs have fallen victim to a mysterious flu and are subsequently quarantined to a garbage island. The villainous mayor of Megasaki City …because all politics are local…has signed an exile decree and continues to use the dog crisis to consolidate power and fill his own coffers. The scientific community opposes him as they race to find a cure, but the mayor’s nephew, Atari, missing his own dog, launches a one man rescue mission to garbage island. There, he is befriended by a democratically inclined pack of dogs who lead him on an adventure across garbage island to find his missing pupper: all while avoiding pursuit from his uncle’s men. The animation choices Anderson made here are first rate. The claymation/ stop motion looking characters are fresh and match Anderson’s whimsical style of filmmaking. The more antiquated visuals enhance the accentuation of the very deliberate scene pacing and line reading that Anderson favors. Anderson paired this smart animation with some first rate voice work; earning strong performances particularly from Bryan Cranston, Edward Norton, Jeff Goldblum, and Liev Schreiber. Surprisingly, Bill Murray did not stand out in the film; rare for Murray in any film but especially in a Wes Anderson production. A lot of interesting ideas were going on in a seemingly simple movie. The mayor’s “blame others”, authoritarian agenda is clearly a metaphor from Trumpism; where instead of blaming Mexicans, Muslims, or the media, a politician discovers that even man’s best friend is an effective foil. It’s clever without being too heavy handed. One knock on the film that kind of bothered me is that the leader of the free media resistance in Megasaki City, was a white, exchange student from Ohio. Anderson intentionally sets the film in Japan, a move that significantly benefits the movie, and then has the white kid come to the rescue. Seems like he could have passed on that script edit. I really enjoyed Isle of Dogs, but it doesn’t quite rise to the lofty levels of Anderson’s best works, The Royal Tenenbaums or The Grand Budapest Hotel. Still, this latest entry is a worthy addition to the eclectic director’s impressive filmography. Overall, I give ISLE OF DOGS 8.5 “I heard a rumors” out of 10. Watson Reviews: Game Over, Man!